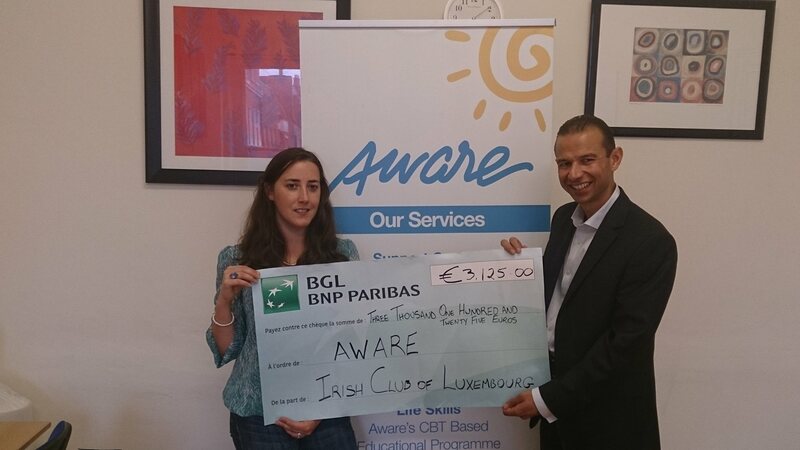 The Irish Club of Luxembourg held its annual ball and charity auction in Le Sud restaurant on 15th June. The theme of the evening was A Midsummer Night's Dream and several guests embraced the theme wholeheartedly. There were numerous fairy wings, donkey ears and crowns spotted amongst the very elegantly dressed crowd. Thankfully the rain stayed away and over 70 people enjoyed the champagne reception on the fabulous terrace. As an unexpected treat the guests accessed the dining room by descending a staircase which brought them through the kitchen where they got a sense of the gourmet evening which was ahead of them. His Excellency Diarmuid O'Leary, Ambassador of Ireland officially started the evening with his speech where he highlighted the great work that the various Irish clubs and societies do in Luxembourg. Up next was newly appointed club President, Hilary Fitzgibbon, who welcomed guests and thanked them for attending, especially when there were so many other events on in Luxembourg on the same night. Hilary also spoke about the two charities that they were raising money for in the charity auction, Stemm vun der Strooss which helps needy people in Luxembourg and Aware which assists people (and their families) who are suffering from depression and mental health issues. Hilary asked the patrons to forget about the monetary value of the items in the charity auction and instead to think about the "soft, warm, fuzzy feeling" that they would get for donating loads of money to two very deserving charities. This year the auction was split into four categories; Entertainment, Leisure/Sport/Travel, Art/Jewelry and Champagne & Whisk(e)y. After each of the four courses, the meal was stopped briefly to auction items from a category. Whether it was Hilary's heartfelt plea for donations, the sumptuous surroundings of Le Sud or the fact that people wanted their next course as quickly as possible, the auction bidding was fast and furious. Vouchers for €50 were sold for €90, cases of champagne went for €350, whilst the highlight of the auction, a magnificent Ben Carter print, achieved €500. As a result of the overwhelming generosity of the patrons, last year's auction total of just under €4,000 was completely blown out of the water. At the end of the night a spectacular total of over €6,000 was raised for the two charities. A number of people, went home without securing anything in the auction, but committed to making a donation all the same, since they had such a wonderful time. Club President, Hilary Fitzgibbon said, "Initially I was blown away by the generosity of everyone who donated items for the charity auction. Never in my wildest expectations did I ever imagine that we would come close to last year's total, let alone surpass it. I want to give my sincere thanks to everyone who bid on items in the charity auction. When I discovered the total for the evening I was overcome with emotion". Everyone in the room shared Hilary's joy and erupted in cheers and applause when the total was announced. It really summed up the goodwill that was present on the night. After the charity auction and delicious gourmet meal, patrons retuned to the bar/terrace area where Ara City Radio DJ, Sam Steen, entertained everyone and kept them dancing until 3:00. There were probably a few sore heads on the morning after but they were definitely worth it! Following the Ball, we had the pleasure of meeting with both charities to hand over the cheques and also to see what the donations would be used for. QuestionPro has graciously provided their software to help us make better decisions than ever before. Their powerful feedback software makes tracking and analyzing critical data easier and more effective, and we are able to more quickly and transparently deliver data to our stakeholders and across our entire organizational influence.